Bubble, bubble, toil and trouble… Can you mix potions faster than your opponent? 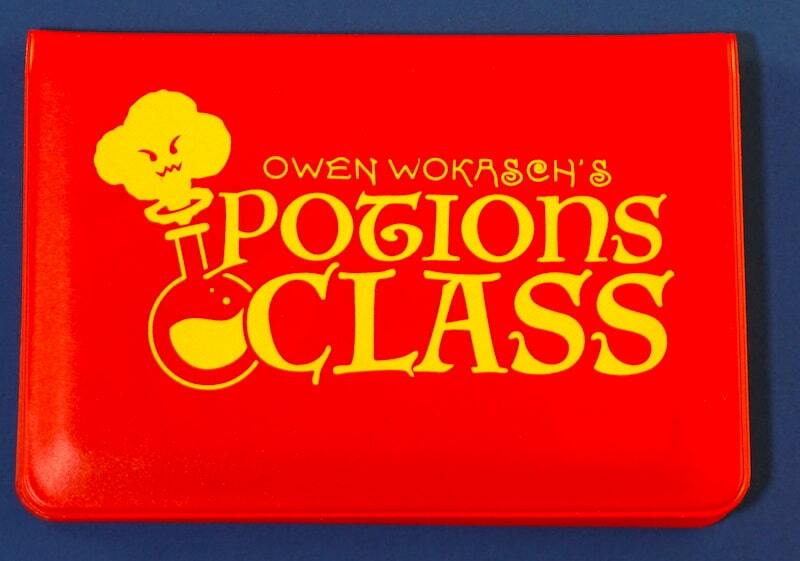 That’s the goal in Potions Class, a micro-game from Button Shy and 9-year-old designer Owen Wokasch. Potions Class sits at a low simmer for us; with just a few changes, it could hit a rolling boil. Let us tell you in about 5 minutes, or read on below. In Potions Class, two players race to be the first to create three potions. On your turn, you draw three cards from the deck, one at a time. One must go to your opponent, one must go to your own reserve, and one must be played onto a potion. 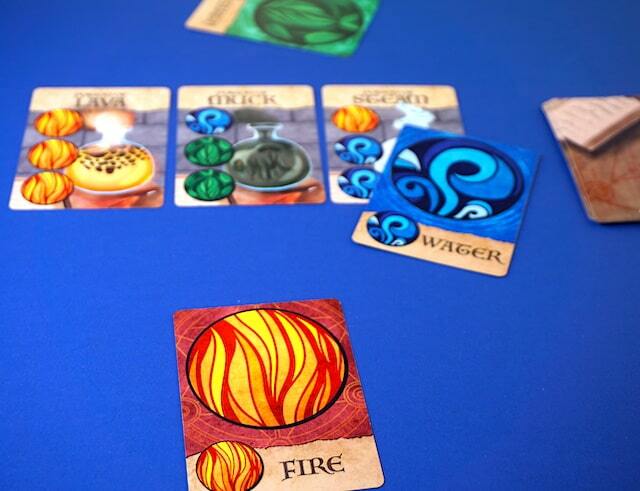 Each card you draw represents an individual element (Earth, Water, Fire), and each potion requires exactly three element cards. Whoever places the third correct card onto a potion, completes it. They get to take that potion as a trophy. Before drawing cards, you may play the cards from your private reserve onto the potions as well. You may also intentionally play incorrect elements onto a potion, which will cause it to explode (temporarily taking it out of play). You can also explode a private reserve by adding a fourth card. So don’t hang on to reserved cards for too long! The strategy boils down to three simple questions: What can I make? What can my opponent make? And how can I stop them? Play close attention to what has already been played, and you can make a good guess as to what is left to be drawn. We found Potions Class to be well-balanced, but since there are so few cards, you can easily predict what will happen near the end of the game. It’s easy to get into a situation where you know exactly which three cards are left in the draw pile. The suggested age range is 6+, which is spot on. There’s really no reading required, and it’s a game that a kid can pick up and understand right away. We really appreciate the mechanics, the art, and the wallet format. It’s a good game for a parent and a kid to play together. But to keep from feeling too deterministic, Potions Class really needs about twice as many cards. The Family Gamers received a copy of Potions Class from Button Shy Games for this review.